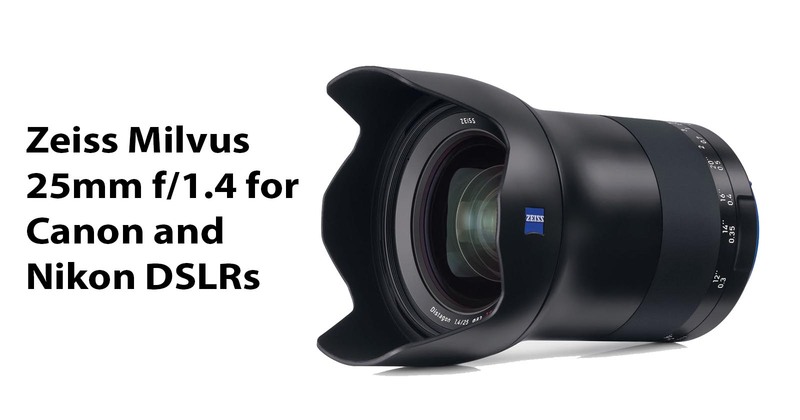 Zeiss has added a new wide-angle lens, the Milvus 25mm f/1.4 lens, its 11th lens to the Milvus family of full frame DSLR lenses. It’s the fourth Milvus lens to have fixed aperture of f/1.4, joining the likes of 35mm, 50mm, and 85mm. According to Zeiss, the Milvus 25mm F1.4 is suitable primarily for landscape and architecture photography, and for journalistic shots and videos, thanks to its fast aperture and a new optical design that uses 15 elements in 13 groups to deliver “high-contrast photos and a harmonious bokeh. They also claim that there would hardly be any color fringes, even when you’re shooting with the lens wide-open. Like the entire Milvus line, the new 25mm F1.4 is manual focus only, and features a robust all-metal housing as well as ‘special seals’ for protection against dust and splashes. The Milvus 25mm F1.4 will be available starting 2nd November for roughly about INR 1,56,000. To learn more about this lens or the entire Milvus line, head over to the Zeiss website by clicking here.